Welcome to the third month of the year—or, if you were born before 150 B.C., the first! According to the oldest Roman calendars, one year was ten months long, beginning in March and ending in December. As the saying goes, March comes “In like a lion, out like a lamb.” And its not just celebrating Saint Patricks Day in County Kerry, there are loads of other celebrations and festivals going on in the County. 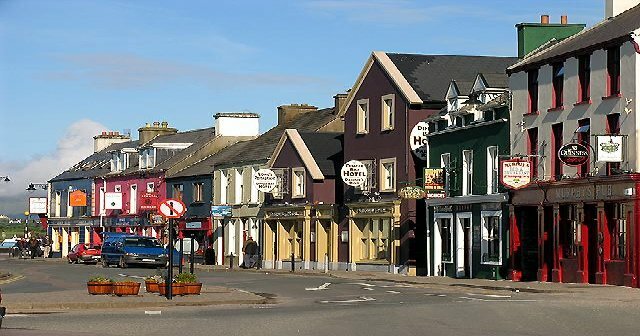 Dingle puts on one or two intriguing festivals and events throughout the tourist season which are unique to the peninsula. The ever-popular Film Festival in March is a must for moviegoers, while the Féile na Bealtaine in April sees performing arts shows all over Dingle Peninsula. St. Patrick's Festival - mid-March, this five-day event culminates with St. Patrick's Day (Lá Fhéile Pádraig) on March 17th, Ireland's main national holiday. With music, carnivals, street performances and various other events in Dingle Town. The Dingle Peninsula in the west of County Kerry Ireland is home to a wealth of archaeological and historical heritage and is of great interest to archaeologists, historians and folklorists or to anyone interested in their Gaelic or Celtic roots. Today there are over 30 monastic sites with a variety of remains such as holy wells, beehive huts, oratories, churches, cross slabs, shrines, burials and sun dials. Some of these have been excavated, explored and studied carefully. Animation Dingle is an annual event that comes together to celebrate the best animation features, series and shorts that the Irish and international animation industry has to offer. Student awards include: Best Irish Student Film and Best International Student Film. The presentation of the Murakami Award to 2015, previous winners include Jimmy Murakami; and Academy Award winner, Richie Baneham. The full and half marathon events debuted in 2013 and attracted almost 1,500 participants from all over the world. The local community has taken the event to heart-its already known as The Peoples Marathon as "a race organised by runners for runners"
Full Marathon Start 9:00 a.m. – at the Fels Point Hotel. Half Marathon Start 10:15 a.m. – at the Fels Point Hotel. Awards Ceremony 1.00 p.m. at at the Ashe Hall. The Sneem St. Patrick’s Day parade – the only one in south Kerry – is well known in a wide area as well as the street market with both local products and stands from all over Ireland. And of course all 6 pubs in our ‘little’ village and our cosy Hotel Bar will give you a warm welcome. Lets all get together and make this the BEST St. Patrick's Day EVER! Kenmare Lace Festival is a fantastic weekend packed full of fashion, friendliness, art and most importantly lacemaking! There is something for everyone with lacemaking and millinery workshops, competitions, fashion show, social tables & more. Lacemaking workshops will be held for adults and children in Kenmare Lace, Limerick Lace, Carrickmacross Lace, Traditional Crochet, Bobbin Lace and Tatting. Comhdháil na Múinteoirí le Rincí Gaelacha Teoranta, is otherwise known as An Comhdháil - The Congress of Irish Dance Teachers. The An Comhdháil website contains information regarding the structure of An Comhdháil, details regarding feiseanna, and links to other websites which may be of interest to dancing surfers! You will find the website is worth a regular visit, as it will keep you up to date with the goings on within the organisation. They will do their best to provide you with this facility. If you have any queries, views or comments please do not hesitate to contact them.